PicoWay tattoo removal laser (Syneron Candela) surveyed 250 people who had one or more tattoos removed and 100 people who were thinking about removing one or more of their tattoos between 9/29/2016 and 10/6/2016. 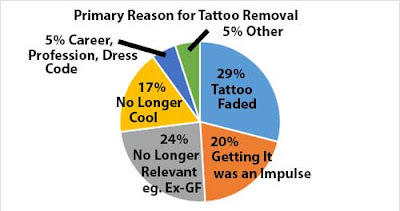 83% who had a tattoo removed were planning on getting a new tattoo and were more likely to do so because they know they have the option of removing it. 13% of this group had it removed because they had become parents. The most commonly removed tattoos were a person’s name. Symbols and animals came in a close second and third.